We supply the complete package – premium-quality French Doors that give your home severe weather protection, provide security against intruders, enhance the beauty of your surroundings, shrink your energy costs, and reduce outdoor ambient sound. Why go anywhere else? Our product line combines sophistication and performance to meet the needs of today's discriminating homeowner. We'll listen carefully to your needs, will work with you to meet your goals, and will watch over your project every step of the way. In addition, our own in-house window and door design professionals are available to meet with you one-on-one to help with planning your project. Combine heavy-duty vinyl or aluminum frames with impact-resistant laminated insulating glass. Includes a Corrosion Resistant three point locking system that comes complete with hardware. Feature an air performance rating (residential and commercial) of .001 CFM. Have NFRC certifications for U-Values as low as .38 and SHGC as low as .12. Add value to your home while improving the appearance and performance within and outside your home. 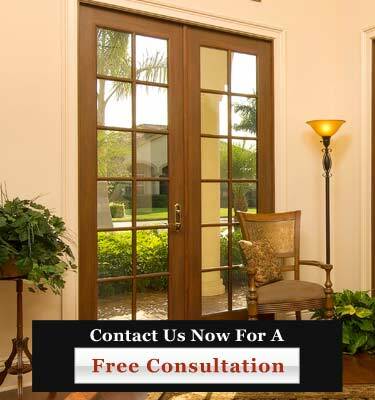 We are your one-stop-shop for the sales, service, and installation of premium quality French Doors. Call us today at 954-714-6800 or contact us online now for an in-depth consultation on your next door project.